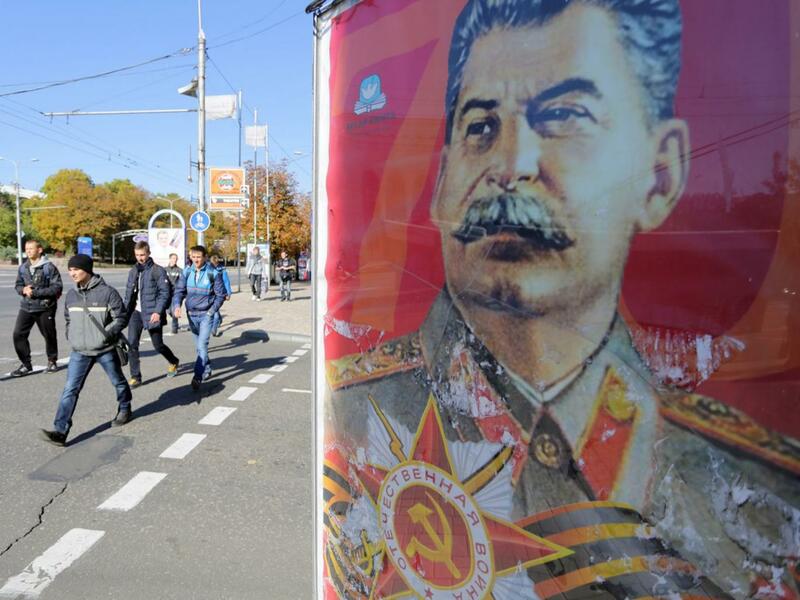 Stalin is making a comeback in Donetsk and other parts of the east. The soldier gazed towards rebel positions down the deserted highway, now a no-man’s land strewn with debris, shrapnel, tank traps and unexploded munitions. Troops in the frontline village of Pisky have a nickname for this desolate stretch: Doroga smart. Driving a further wedge into Ukraine’s bitter divide, separatist authorities have imposed a new time zone on their breakaway republics to keep them in line with Moscow. Just a few hundred metres from this frontline position, it is no longer GMT+2, but GMT+3. While this only lasts during the winter months, prompted by Russia’s decision to reject the European habit of setting the clocks back, the change underscores the growing gulf between Ukraine and its rebel-held statelets as fighting flares once more. More than 9,100 people have been killed in clashes between the pro-Russian separatists and government troops since April last year, despite numerous attempts at a ceasefire. Some in the separatist stronghold of Donetsk have welcomed the altered time zone. “We are Russia now – why stick with Ukraine’s clocks?” said Vasily, a pensioner in his 60s, identified solely by his first name due to ongoing security concerns. For others, it is purely of practical benefit. “It’s nice that it stays lighter longer though I feel like a foreigner in my own country” said Maria, an office worker in her 30s. But pro-Russia rebels have not only synchronised the clocks with Moscow’s present. They continue to revive a shared Soviet past as a means of forging a new identity to shape public space and policy. Long considered taboo, Stalin’s cult of personality has been resurrected. Portraits of the dictator appear in Donetsk’s main square and adorn most separatist commanders’ offices. Rebels have rewritten school history books to take a pro-Russian slant and airbrush Stalinist atrocities. Eduard Basurin, the rebels’ Deputy Minister of Defence, pins a badge of Stalin to his military fatigues and is defensive when questioned why. “I respect this man,” he said. Such nostalgia in the restive east is understandable. The collapse of the USSR sent Ukraine’s industrial heartland into a spiral of decline; demand for coal dried up and inflation ruined miners’ pensions. For years many in the region have yearned for Soviet-era stability. Disenchantment and industrial paralysis thus provided an ideal incubator for Soviet nostalgia. The hammer-and-sickle is now a regular sight throughout rebel-held territory, flaunted alongside Russian flags and the banners of various militant factions. Soviet fervour is perhaps most extreme in the Luhansk People’s Republic (LNR), which straddles the Russian border and centres on the forlorn city of Luhansk, Ukraine’s best preserved Soviet-era city. The emblem of this separatist territory is the embodiment of Soviet kitsch, complete with red star and sheaves of wheat. A smaller eight-pointed star is a simultaneous nod to Slavic paganism, Orthodox Christianity and the Eurasian Economic Union. The LNR parliament’s powerful communist faction is understood to have pushed through this heraldic symbol in favour of one based on Catherine the Great’s coat of arms and a more neutral one modelled on the shape of the Luhansk region. Local councils in sovereign Ukraine continue to act on a raft of new laws which prohibit the display of Soviet symbols and have led to the toppling of numerous Lenin statues. This controversial, nationwide overhaul has prompted horror among rebels, with the LNR’s autocratic leader, Igor Plotnitsky, branding it “moral genocide”. Looking ahead, the clock is ticking for a resolution to when, and in what form, the rebel-held east will hold local elections, postponed after the rest of the country went to the polls in October, something required by the peace deal agreed in Minsk earlier this year. Back on another stretch of the front line, government soldiers stationed in Mariinka seem unfazed by the unsolicited time zone that appears just one hundred metres away. In an abandoned cottage on the edge of no-man’s land, a platoon commander laughed it off as an opportunity amid a war that is proving as intractable as it is incessant. “The separatists will be celebrating New Year one hour before us,” said Chester, in his 30s.